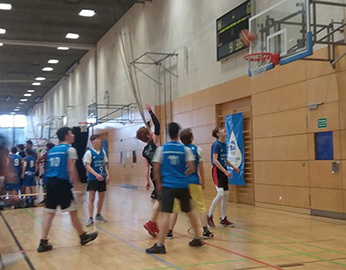 Two NMS teams took part in this school year's Berlin ALBA Upperschool League (ALBA Oberschulliga). Both teams played in three tournaments, the preliminary, intermediate and final rounds. In the Boys Class II (birthyears.02-05) preliminary match the NMS team won third place in the Beginners Group, in the following intermediate round they won first place. 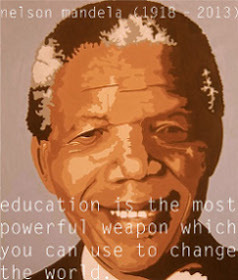 This enabled the team to go up to the higher Junior Class level. 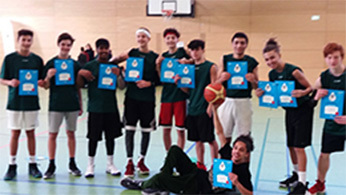 The final round took place on the 22nd of March, in the Max-Schmeling-Halle. 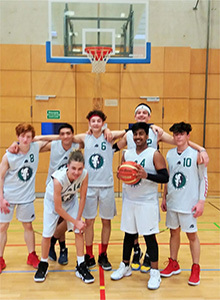 Decked in their new basketball kit (which was sponsored by the NMS Förderverein) the NMS team played beautiful combinations against the Virchow-OS, the Barnim-Gym and the Hans-Grade-OS, winning all their matches and placed a well deserved 1st place. 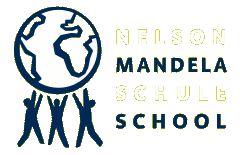 The NMS Boys Class I team (birthyears 00-03) won second place in the preliminary match, third place in the intermediate round and third place in the final (Junior).